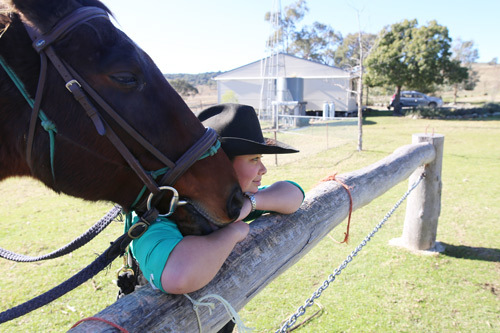 Ba Mack Farmstay is the Ultimate Interactive Farmstay in NSW with Luxury Accommodation. We are a very scenic 25 minute drive on a tar sealed road from Mudgee in the Central West of New South Wales, Australia. Mudgee is a beautiful country town and very famous for its amazing wines, delicious honey and superfine Merino wool. We pride ourselves on providing personalised attention to your family, luxury accommodation and the perfect example of genuine good old fashioned country hospitality with all the comforts of home. You are going to love your stay with us; we offer so many farmstay highlights for your whole family to enjoy. Every morning starts with a full country breakfast then feeding our many farm animals, bottle feeding baby lambs, collecting chicken eggs and led horse rides around our 285 acre farm. After lunch there is Kid’s Club and baking homemade afternoon tea for you to enjoy at your leisure. All our activities are tailored to your individual personal needs and are complimentary during your stay. Ba Mack Farmstay is a holiday experience that you will never forget – Your family will never want to leave. Hello, my name is Julie McLeod and together with my daughter Kate, we would very much like to welcome you and your family to our very friendly, relaxed and interactive farmstay with luxury accommodation. Our zest and passion in life is to share our farm and love of animals with you and your children. Please do not worry if your children (or even yourself) are nervous around animals. We have specifically limited our farmstay to just two beautiful accommodation options so that we are able to spend as much time with you as you would like to help overcome any fears you may have. All our farm animals are extremely friendly and personally handpicked so that we can give you a very special experience with animals. Kate and I just love giving children and adults an amazing experience of farm life. You will be able to feed, touch and play with our farm animals in a safe and caring environment. We take the greatest pride in offering genuine, good old fashioned country hospitality with all the comforts of home. Your family (no age restriction) will be given the opportunity of an introductory horse riding lesson (on a lead) on one of our beautiful horses. Then, up to an hour horse ride around our farm (on a lead) every day. Each afternoon, your Children (and parents if you would like to join us) are welcome to help me bake afternoon tea in the homestead kitchen. Children can learn how to bake scones, biscuits and all those yummy afternoon treats that we all grew up with as a child. You will feel very much a part of our family and farm life from the very moment you arrive. I promise that you will thoroughly enjoy your experience of visiting us. We can’t wait to share our farm and animals with you. A true “hands on” animal experience. Kate and I love giving children an amazing experience of farm life. You will be able to feed, touch and play with our farm animals in a safe and caring environment. We take the greatest pride in offering genuine, good old fashioned country hospitality with all the comforts of home. Every day, my daughter Kate and I will also give your children (of any age) an introductory horse riding lesson (on a lead) on one of our beautiful horses as well as up to an hour horse ride around our farm (on a lead). Ba Mack Farmstay is a holiday experience that you will never forget. We have so many animals for you to help feed, pat, touch and just simply love. You will feel very much a part of our family and farm life from the very moment you arrive. Complimentary Kid’s Club is available every afternoon with lots of fun activities for your children.